First World Sob Story: I Need a New Phone, Do You? My iPhone 4 is crashing. And I’ve been complaining about it for months. I haven’t even had this phone for very long—about two years. I bought it from my boss at my last job, and I’m sad to say that I think it is flashing its last screens. The apps are lagging. Sometimes, when friends send me videos on Snapchat the app completely freezes and I have to delete and re-add it from the App Store. The texts aren’t sending. And I don’t have a data plan, so I can’t use iMessage or WhatsApp unless I’m on campus or at home. Last Thursday, my texts froze for 24 hours. I couldn’t send or receive any messages. What if I was commuting, or out of town, or getting attacked by wolves?? Perhaps Apple is out to get me with a phone that doesn’t support all of their software updates (iOS 8 why you do this) so that I’m forced to upgrade. Or perhaps I’ve just dropped my phone too many times. Regardless, I recently found myself needing (wanting) a new phone. And for the #2s who are looking for #1s, rejoice! Although I am also a #2, I have a liiiiittle bit of knowledge I’ve gathered in my phone-hunt that I’d like to share with you. And for you #1s: please share advice. The first thing I’ve gathered is to have your own parameters set for what you want, especially a budget and a size. For example, I want a good camera and high- speeds. My budget is low and I want the phone to fit in my wallet. Then call your phone company. Actually, call all of the phone companies! Tell Bell what Rogers said, and Rogers what Bell said, ask loads of questions about prices and what you want from a phone, and if you have any upgrades available. Ask yourself the big question: iPhone or Android? Tell as many people as you can that you’re looking for a new phone: friends, coworkers, family, the guy across the street—you never know who’s selling or who has suggestions. People sell phones in great condition on Kijiji, but be cautious of scams. If you can’t go into a store where they sell phones, watch videos of phone comparisons. This can give you an idea of the size of a phone, the feel of the phone in your hand, and how the phone is doing in the market. Someone told me this week that it’s all about “the specs,” or the features on the phone. Videos tell you the specs in detail! Check out this awesome YouTube channel called PhoneDog, where I’ve been watching some comparison videos. A couple of the new phones that I’ve found in the constantly updating market are the Nexus 5 and 6, the iPhone 6, the Samsung Galaxy S5, the OnePlus One, the LG G3, the Sony Xperia Z3, and the HTC Desire. Google away, friends! And most importantly (unlike me, still on the hunt! ), make a sound decision before your phone actually crashes. You have been warned. Good luck, phone warriors. Add the layers. Bundle up. If you don’t have a hat, gloves, and scarf, this is the time to invest in all three. The cold weather that makes Canada famous is starting, just in time for students to enjoy the frosty, bone-chilling—as some would call it (including me)— winds. Yes, it is −30 degrees, but that isn’t a good enough reason to cancel school. On the bright side, especially when the sun is out, you are reacquainted with old friends. You have the opportunity to make new ones. It is a fresh and wintry start. If you frequently check the Weather Network, you’ll notice radical drops in temperature, with subtle decreases. Does this mean we stay indoors? No. Realistically, would we like to? Most likely, probably, yes. When you feel walk around campus in the −30 degree weather, you start to wonder what’s wrong with the world, but should we shut ourselves in because of these chilly temperatures? No! We all head to class, wait for the bus, and wonder how and why certain buildings aren’t equipped with heaters or still have the AC on… I mean really, it doesn’t need to be a sauna, but more cold—no, thank you. Look for alternative routes to head to class. This is time to walk inside the CCT building rather than outside to head to IB, Kaneff, or the Student Centre. Leave early, arrive early, and warm up. For commuters, sadly, the shuttle buses aren’t heated and for some reason there is always that student who has to open the window and forgets to close it (don’t do this). To make a possibly long blog post short, there is no escaping the cold weather and we can all enjoy complaining about the decreasing temperatures, but there is an easier way to start making things better. This doesn’t have to be a time of dreary, angry moments during a (soon to end) season. Take control of what you want to do, regardless of the possible snowfall centimetres. Time to curl up with that great book. Get some coffee, hot chocolate, or another warm drink to heat up. Spend time with some friends. Take up a winter activity—skating, skiing, going to a warmer place. Most importantly capture your cold moments. Look back in a few months and share the laughs, and the cries. The Struggles of Being the Only Single Friend In Your Group. 1) Having no one to watch that new romantic comedy with because your friends already saw it last week—with he-who-must-not-be-named. It’s okay girl. Netflix got you. 2) Having an uneven number of guys and girls in the picture—and it’s all your fault. 3) Giving attention to a guy you normally wouldn’t even consider. 4) Your friends ask you for advice and you have little to no romantic life of your own to make reference to. I don’t know, Jessica. I don’t know. 6) Every time you hang out with just your girls it’s declared a “girls’ night!”, even though every night is basically a girls’ night for you. 8) Saying, “I have a boyfriend,” to guys you’re not interested in and on the inside you’re like “LOL”. We all do it. At one point, I was saying it so often I was actually starting to believe it. 9) Your friends talk about the things their boyfriends buy them and you want those things too but wonder if it would be lame to buy it for yourself. 10) You all have Pandora bracelets—theirs were presents from their boyfriends and yours was a present from you. 12) But hey, at least you know what you’re doing on valentines Valentine’s Day! It’s great to be proud of yourself; we are all awesome people with unique talents, skills and personalities. The world is a unsettled place, but our lives lay ahead of us. We have destinies to forge, and potential greatness to realize. It’s the most exciting time in our young lives. However, pride has its limits; beyond a certain point, it becomes distasteful to those around you. Ego has to be kept in check; we are all human, after all, and none of us are without our flaws. Thinking that we’re above the people around us, that we’re more important to the world than the strangers we pass by and meet everyday is an ideal that is destined to fail. As students at UTM, we still have a lot to learn about the real world and ourselves. We’re each the sum of different histories and experiences; don’t place yourself on a pedestal when you have no idea what other people have gone through. Their unknown hardships, and their evident compromises and triumphs, will surely make yours seem insignificant in comparison; if they compose themselves humbly, than you should to. Humility is an under appreciated practice in our generation. Living within your means, not asking too much of others, choosing not to take yourself too seriously…these are all humble practices. They don’t devalue or depreciate you as an individual, they just make you more approachable, reliable and relatable. As cool as you think you are when you wear overpriced clothing or buy a new piece of technology, you will be even cooler to those around you when you present yourself as you really are. Look around and you’ll see dozens of teens who reflect what they believe society has determined to be favourable. They act like they don’t care about anyone else because that is apparently what justifies being cool. A totally flawed, totally misjudged perspective on being a member of the community in my opinion. They will find themselves eventually, because we all do in some way or another. In simple terms, be yourself; when you’re proud of living as you truly are, everyone else will see it too. Respect yourself and those around you, but don’t lose sight of your own human vulnerability and fallibility. 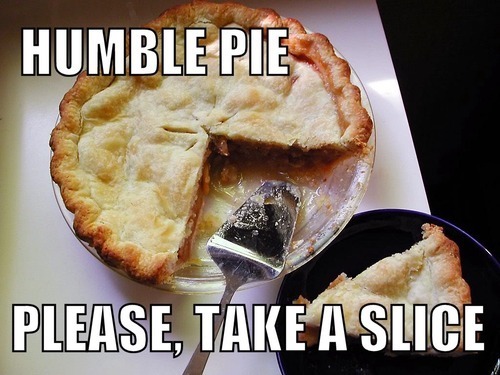 Have a slice of humble pie every once in a while… it’s better for you than you think. I believe that power relations exist everywhere. Our lives as university students are riddled with them. Profs, parents, bosses, friends—our relationships with these people question our beliefs and what power we hold every day. Personally, I can be short -tempered. Little things that people say, although I smile on the outside, can completely set me off on the inside. Perhaps your beliefs are being questioned, or perhaps an authority figure in your life said something offensive, but if you’ve ever had an instance where your mind is screaming, “That’s unfair!” or, “That’s wrong!” or, “What did she just say? !”, you’ve probably experienced being set off too. But when your prof or your mom or your boss or any figure holding authority in your life offends you, what should you do? If you speak up, what if the prof holds a grudge, or your mom doesn’t speak to you, or your boss fires you? All thoughts that rush through my head. And all manageable. But it depends on the situation. When a prof made me feel ridiculous in front of my entire class last semester for asking a simple question, I responded by writing a blog post, and even pasted the link to the post into my comments during course evaluations. When one of my managers told me that I broke a speaker that I actually didn’t touch, I made a sarcastic comment. On the contrary, when my mom tells me to clean the house… Well, I clean the house. 2) What’s the worst that could happen, realistically? If you can’t handle the worst, you probably aren’t ready to handle the situation. I suggest taking a deep breath, and re-evaluating the situation. To comply or not to comply, to speak or not to speak—a moment’s thought can change how you respond to being offended, and how you respond reflects a little bit of you. What kind of person are you? What kind of person do you want to be? We are all being shaped as people in our university experience. Our compliance is tested through how we interact with authority in our lives. More often than not, I choose to stand up for my beliefs. What situation will elicit a voice from you?